I'll be posting my baking and cooking activites in the kitchen on here for you to enjoy, so you can follow any tips, or join me in a bake off and see whose kitchen magic is better! Hello everyone, massive apologies for my lack of blogging recently. I can make a million excuses but instead I'm going to skip straight over this and update you on my baking delights! 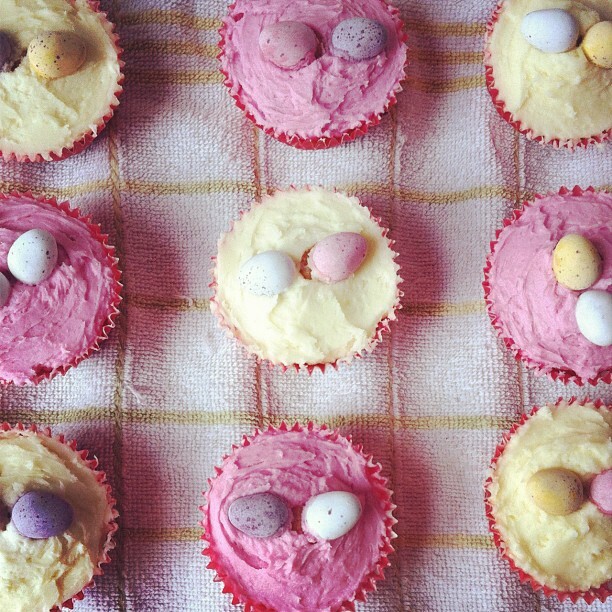 My first baking mission was to bake some special Easter themed treats! I was torn between simple chick shapes biscuits or vanilla cupcakes with a mini egg twist... I think you can tell from the photo which idea I went with. 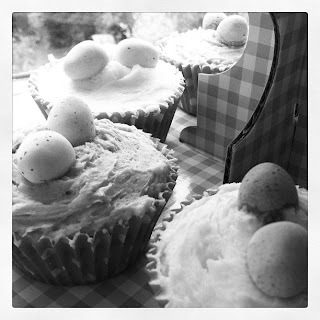 One of the main reasons why I went with the cupcakes Is because they are just much more fun, and I had a evil bag of mini eggs staring at me everyday, so by putting them on cupcakes they seemed more friendly and I could share they joy. Yet again, the basic vanilla cupcake recipe came from The Hummingbird Bakery Cookbook. It is my go-to book for cupcakes and for the first time I managed to really concentrate and make the perfect batch of 12, so they were the right size and consistency. More importantly I restrained myself this time and I didn't over do it on the vanilla extract and I now understand less is more! I used be a little sneaky and add 1/2 teaspoon more than the recipe stated and the same in the icing. 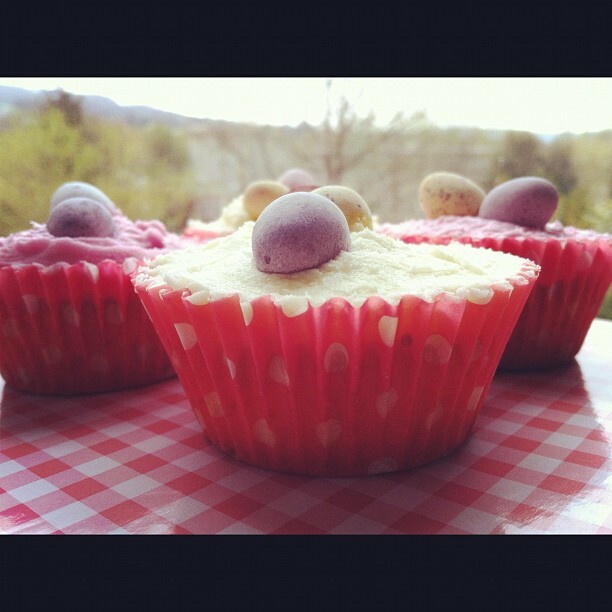 I thought it would make them taste better, but I can now safely say that these Easter cupcakes were delicious with the right amount! I was thinking about making chocolate cupcakes so that it would go better with the chocolate mini eggs, but I wanted to play around with a colour scheme. I had just received a new 2 tiered cake stand that was pink and white, new pink and white polka dot cupcake cases, so you guessed it, I wanted to make pink and white icing. Not only did the whole theme work really well, but the pastel colours of the mini eggs looked much prettier against a pale background. Only a select few friends were special enough to have these little gems, but they still went down a storm! Me and my good friend Hannah, usually have a tea and cake day about once a month, hunting out the best cake shops in Bath. This week, however, the weather, money and Hannah being a tad poorly, meant that we decided to have a nice chilled out movie and baking day, and what did we make... scones! It was my first ever attempt at making scones and I think I did alright! They were so unbelievably simple to make and took no time at all! For the first time I actually managed to track down Buttermilk in Morrison's, well, actually Hannah did with her beady little eyes! 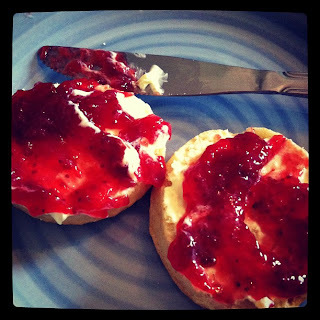 I also treated myself to some scrumptious clotted cream, which is a bit of given with scones, and some extra special strawberry jam! I think as it was my first attempt they wouldn't win any prizes, but they were a perfect little cheer up treat for two very worn out lasses! 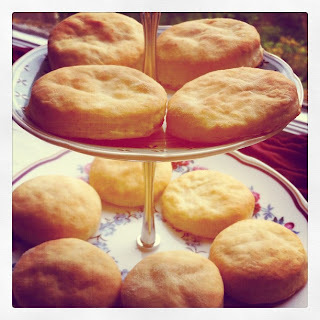 A few things I would perhaps adjust for next time, is that I would use a larger pastry cutter as these scones turned out a little on the wee side, but they looked cute so I don't mind. I would also keep a better eye on the timer as the last three were a little more cooked than the others... but who cares they still tasted delicious! 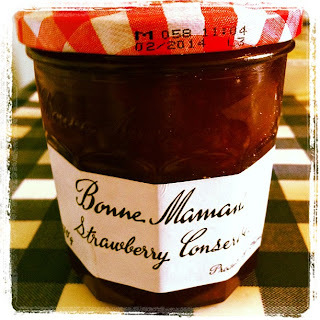 I'm eating my last one as I write this post!